One week from now, I'll be on a girl's road trip to Stampede in Calgary, Alberta! It's not a quick road trip: a 12-hour drive each way, but well worth it to see one of our high school friends and experience Stampede together. For those of you not familiar, Stampede is a massive annual rodeo event, full of parties, amazing eats and of course some western rodeo shows. I may not be the hugest western/country fan (like not at all), but it does sound like a pretty good time. As I started packing for our trip, I thought I would share with you what I'm bringing along, as I think most of these would apply to any road trip or summer trip you're planning to do this summer. Keep reading below to see what to pack in your bag! I'm also hosting a giveaway on Instagram, so make sure to check that out as well - more details on that below too. We're going to be staying with friends for a few nights in Calgary during Stampede, so I wanted to pack some travel-sized skincare. This handy mini kit from Di Morelli includes all 3 skincare essentials: their Cleanser, Vitamin C Serum for Face & Eye and SPF 35 UVA/UVB. It even comes with 2 samples of their Brightener as well. It's a perfect kit to keep on-hand for trips like this. The light foaming Cleanser removes sweat (definitely going to be lots of that), makeup and excess oil without causing irritation or dryness. The Vitamin C Serum for Face & Eye firms, brightens and improves the overall health of your skin. It also stimulates collagen and protects the skin against environmental damage. I like that it's a face and eye serum in one; in a travel kit, double-duty products are important. Most importantly is the SPF! I find that usually most facial lotions are SPF 25 and under. As someone who burns easily, I appreciate a lotion that's as high as SPF 35. Especially during Stampede, when I'm likely to be in the sun all day, having a good facial sunscreen is key. The Brightener is a nice added bonus, used to exfoliate the skin with natural acids. GIVEAWAY: What to win a Di Morelli Essentials Mini skincare kit for yourself? 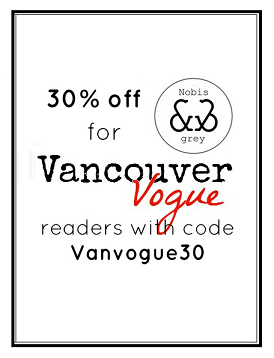 I'm giving away one on Vancouver Vogue's Instagram right now! Head over there to enter. I don't thrive well in heat. So I have a couple of secret weapons to help me feel...not gross. That includes mitigating sweat and keeping my skin hydrated. Dove's Dry Spray in Cool Essentials has been the only antiperspirant I've trusted over the last 5 years. I seriously haven't found anything better. It keeps my sweat under control, and the light fresh scent makes it good for re-applying throughout the day to keep you smelling good! Secondly, I love this little travel sized bottle of Avène Thermal Spring Water Spray for keeping my face hydrated and refreshed on a hot day. It's all about the water's soothing and softening properties. The bottle is easy to stash in your purse during the day too. It's also great to spray on a sunburn (let's hope I don't need it for that though). Don't get me wrong, Stampede is going to be fun from start to finish each day, but my face is probably going to show those long days and late nights. If I don't get enough sleep, my eyes do tend to get a bit puffy. To combat that on-the-go, I carry my e.l.f. Studio Eye Refresh and apply in the morning before going through the rest of my skincare routine. It's insanely affordable ($4.99 at London Drugs), and the roller ball applicator makes it easy to apply. It makes your skin feel cool and refreshed, helping to de-puff those tired eyes! Now I already spoke earlier about the necessity of SPF for the face, but of course sunscreen for the body is also equally as important - especially if you're on a trip where you'll be out in the sun all day. For Stampede, it's a must. The best of the best is La Roche Posay's Anthelios XL Lotion SPF 60. La Roche Posay won the title of 'best sunscreen of 2017', after all. On any summer trip, dry shampoo is always a good bet. Especially when you're road tripping. And this, let me tell you, is seriously the best dry shampoo. This is actually the first dry shampoo I ever tried, and just assumed they were all this good - until I tried a few others afterwards, and they definitely didn't live up. You can find L'Oreal Professional's Techni Art Fresh Dust at select salons (like Suki's in the Vancouver area), or online. These Minimergency Kits from Chapters Indigo are a must have! I keep one in my purse all year round, but it's especially useful when on a trip. It has SO many useful things packed into this tiny zipped package that you may find useful on a road trip or at a summer event like Stampede. That's it! Don't forget, if you want to kick-start your own summer trip beauty kit, you can head over to Vancouver Vogue's Instagram to enter for a chance to win a Di Morelli Essentials Mini skincare kit! Seems to be a nice product. It's true that the Vitamin C Serum for Face & Eye firms, brightens and improves the overall health of your skin. I too use vitamin C based cream lifecell anti aging cream and its really very effective. Thanks for sharing surely gonna try these products. Road trip vacations are easy to arrange and offer opportunities to save money. If you are searching for friendly and convenient tour mode, then go for RVs Road trip vacations are easy to arrange and offer opportunities to save money. If you are searching for friendly and convenient tour mode, then go for RVs.